Costa Rica immigration is not hard but it does take some time and some money and some work on your part (not much work, really, if you hire a good attorney). Costa Rica immigration by becoming a “Pensionado” which means you have a guaranteed minimum income of $1,000/month from something like a government pension or social security. Immigration to Costa Rica using an attorney to help you (i.e. I am not an attorney and am not here to show you how to process your own Residency. I did not do that so I can’t tell you how to do it! a pension program from a private company. The $1,000 can come from various sources, as long as the combined income from those official pension sources adds up to at least $1000 U.S. per month. The Temporary Residence under the Pensionado Category is valid for two years and can be renewed for additional two year periods. After three years, the person is eligible for Permanent Residence. Under this category of “Pensionado”, the main applicant (the one with the social security income or pension) is allowed to obtain residency for additional family members such as spouse, parents, and children. #1. Find a highly recommended Costa Rica Immigration attorney. In choosing an attorney for your Costa Rica residency try to find at least 3 sources (real people and not necessarily just names on a web site) of people who actually used the attorney’s services, and who have very favorable reviews of their experience with the attorney. Do some serious research on this as finding the right person for your Costa Rica Immigration is Important! Don’t go with the first positive review you read on a forum or web site like this one. Dig a little deeper and find various sources, and if you can try to actually talk with someone who used the attorney about their experience. Forums and web sites can be legitimate sources of info but try to confirm on at least 2 forums that the attorney is indeed a good choice. Then write the attorney via email and see if he answers in a timely manner and if he does a good job answering any concerns or questions you have. In my opinion, in this day and age, I would not hire any attorney who does not answer emails within 24 hours. In my case I asked my attorney about 4 questions before going with him, after I had read good reviews of his services and read his web site over to see if it was professionally presented and so forth. Consider: Does the attorney speak good English or whatever your language is? If not, do you speak Spanish well enough to understand him? Find out the price and whether or not the money is due up front or if it is due “half down, and half on completion”. I would not pay anyone the full amount up front. I think half down and half at the end or near the end is the best way to go. NOTE: We were very happy with the attorney we chose! If you subscribe to this blog and let me know you’ve done so by adding a comment below, I will send you the contact info of our highly recommended attorney. Application Form – Your attorney should be able to send it to you via email or a download and then you can fill it out and send it back. Birth Certificate(s)* – usually you call or write the state you were born in to order these for you and if you have a wife/husband or children you will need it for them as well. Police Record(s) or Police Letter of Good Conduct* – What? You don’t have a record? Never been arrested? Good! But you still need proof of that. There are options here – ask your attorney. The “preferable” document here is an FBI report but they say, but some attorneys will allow you to get only a report from your local Sheriff’s Dept..
*NOTE: These documents have to be “apostilled”. I know: What the hell is that? How do I get it done? “Apostille” is a fancy French word that means the documents have to be sent to a government office for a stamp and/or seal and sometimes a coinciding letter or document along with the stamp and/or seal. NOTE: All these documents (birth certificate, marriage proof etc) have to be ordered anew. Old ones will not suffice. Getting all these Apostilles is not as complicated as it sounds but it can take a couple months. Anywhere you get your birth certificate and police “letter of good conduct” or police record, and marriage license they should know what an apostille is and tell you how to get it for your document. In our case we simply sent the birth certificates, once we got them in the mail, to the Secretary of State of the state we were born in, via a web page. Google Is Your Friend! Type in, for example “Apostille for Idaho State Birth Certificate” and you should find the info on what you need to do to get your birth certificate apostatized. Or call the Birth Certificate office or your state’s Secretary of State’s office and ask them “Once I get my birth certificate how do I get it apostilled?” They sometimes ask what the Apostille is for and be sure to tell them it is for becoming a legal resident of Costa Rica, Central America. Usually – at least in our case – you just send scans of the documents to the attorneys as you get them, and then once you are physically IN Costa Rica, you will send them or personally deliver the documents to the attorney. Doing all this before you actually move to Costa Rica is highly advised and in some cases, necessary. For example, the police letter is something you pretty much have to go in person to get so get it before you move to Costa Rica! If you want our personal recommendation of the attorney we used who got us our Residency in 8 months with only 3 meetings of any type we had to go to, please drop a comment below in the comments section and subscribe to our blog. We will then send you the contact info of our attorney. #1. Get an appointment with the American Embassy in Costa Rica to get an official letter of proof of Social Security. This document for Costa Rica Immigration has to be done in Costa Rica at the Embassy, unfortunately. They won’t accept a printed page from the Social Security web site. They have to look it up themselves when you’re at the appointment, and look you over and then print and sign the document which then goes to your attorney to submit to Migracion. Note: I do not know what you do if you are applying for Costa Rica Immigration with a different form of income such as a private company, union or military income. This would be a good question to ask the attorney you are considering working with, to see how clearly and quickly he or she answers you! Sometime – usually within a month or so – after you get your social security or other proof of income documents to your attorney, for your Costa Rica immigration application, your attorney will make an appointment for you to get your finger prints done here in Costa Rica. In our case, our attorney’s assistant picked us up in San Jose and took us where we needed to go, “held our hand” every step of the way, got us in ahead of other people, and told us what to expect. It’s easy, really – you just get shuffled from one room to another and finally get your fingerprints done. In our case it took less than an hour from beginning to end. Your mileage may vary depending on your attorney, how many people are there that day, which office you go to, and so on. In our case we waited 6 months for the next contact from our attorney which is very quick – it can take over a year in some cases! Driving in Costa Rica requires that you renew your country’s drivers license by leaving Costa Rica and coming back in which automatically renews your license for another 90 days! Yes, it’s crazy. But yes you have to leave the country every 90 days or else your license is expired and any insurance you have will be null and void and if you get in an accident you will be sorry! There are posts in forums around the web saying you have to leave for 3 days. That is not true. One day – no 5 MINUTES – in another country will renew your license as long as you get your passport stamped to show you did leave Costa Rica legally and come back in legally. Most people choose to go to Panama or Nicaragua unless they fly back to their home country. I’ve recently heard Panama can be stickier so check with the Costa Rica forums (that’s a link to one) to ask if there is a problem. We chose to drive to Nicaragua with two overnight stays in La Fortuna where Arenal Volcano is, to make it less painful. A couple hours in some hot springs with a beautiful view of the volcano after a nice dinner, can make the drive a lot less of a chore so we would stay one night in La Fortuna on the way there and then one night on the way back. One can drive all the way up and back in one day but believe me it’s a stressful, burn-yourself-out thing to do! As to Nicaragua itself, all I can say is the part of Nicaragua we went to (San Carlos, above the Las Tablillas border crossing) is not a place I would ever choose to go to and I doubt you would either. But it’s the closest to us so that’s where we went. Here you can read all about that experience of Driving To Nicaragua to Renew My Drivers License. 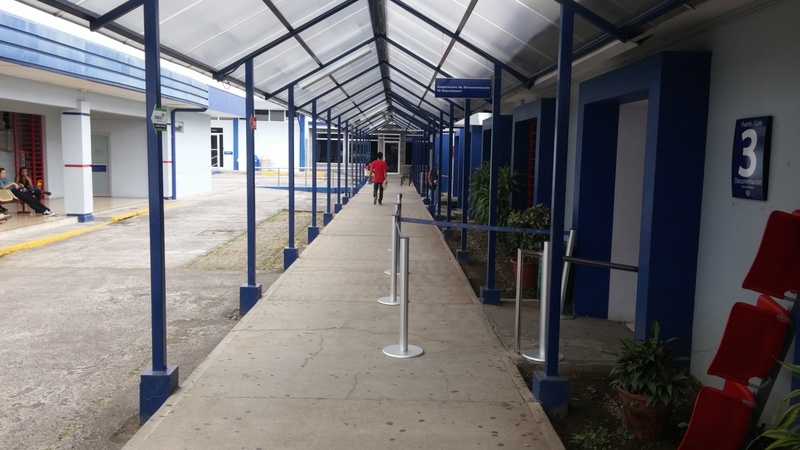 And here you can read my opinion / rant about how stupid it is to have to leave Costa Rica to renew your license when you are legally applying for residency. 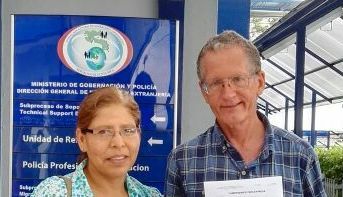 The next contact was our attorney telling us that we had been “Approved For Residency” and now we would have to go to a meeting in La Uruca to get our DIMEX (Costa Rica ID) cards. On the appointed day we met our attorney’s assistant and she took us to the Immigration offices and again held our hands so to speak and showed us where to go and what to do and then we sat in a room and waited. We got there early so we waited what seemed like a very long time. In reality it was only about 2 and 1/4 hours. The assistant to our attorney told us “you may get someone nice or you may not get someone nice. Just answer the questions and don’t say anything unless they ask you and keep your answers short and to the point.” This is exactly what they say if you are called in to a court case in the United States. Easy enough: just answer the questions. Yes, they will be in Spanish. Why not? You really NEED to speak Spanish if you are going to live here! If you haven’t started to learn do so NOW! There is no excuse for not learning at least the basics. There are free online lessons, there are books, there are teachers, there are schools! LEARN SPANISH! Not learning Spanish is the #1 Reason why people do not adjust to living in Costa Rica! Okay, end of Lecture. I’ll get off my soap box now. So anyway, we were lucky. Our immigration officer was super nice and didn’t ask us a thing and just told us to sign a couple things and he took our pictures for the ID card and said Congratulations! That part of our day took about 5 minutes and couldn’t have been easier or less painful! It was only the waiting for our name to be called that was painful! READ OUR COSTA RICA RESIDENCY STORY HERE ABOUT THE DAY WE GOT OUR DIMEX CARDS! It will give you more details about our personal experience before, during and after the Migracion appointment. If you have any questions or comments please share below! So that, in a nutshell, is how Costa Rica Immigration works if you are applying for Pensionado Residency and hire a good attorney to help you! Please send me your Attorney information. Thank you! Hi I would be happy to if you will contact me via the contact page with your email address.